At a board meeting of Embrace PFC CIC, we were discussing ways of raising funds to provide session workers as many of the funding opportunities seemed to cover admin costs. The idea of a sponsored walk was put forward. Now, I’ve done some walking before, albeit a long while ago, but remembered the good parts (and some bad – like jumping from clump to clump of the solid bits in crossing boggy areas of Dartmoor!). I thought it was a great idea – especially as we hadn’t got to the scary things like jumping out of planes and abseiling down buildings. So that was it. We were going to do a sponsored walk. The Norfolk Coast Path was chosen as it is local and spectacular. We decided a four day walk would be good. That way we could still work on the Monday and Tuesday and also have some kind of event on the Saturday evening after the final day’s walk. Also, we’d better avoid June as it was too soon and July/August due to holidays and the heat of summer (good call on that last point this year!!). So that’s it, it’s settled. 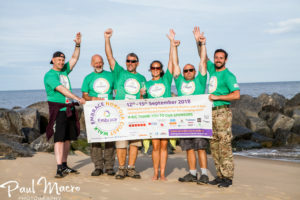 The Norfolk Coast Path over a four day period, the 12th to 15th September. 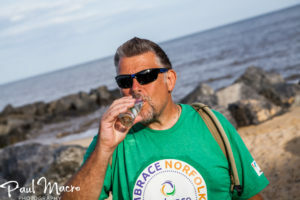 Not long afterwards, I realised that the path has been extended and runs from Hunstanton to Hopton on Sea and is now 84 miles long….. That’s 84 miles in 4 days. The maths genius that I am didn’t take long to work out that was an average of 21 miles a day. Now the fear set in. I work in an office, don’t do much exercise and carry a few extra pounds (ok, extra stones). I can’t remember walking more than a couple of miles in recent history. I would also be around 20 years older than the other participants as I would have my 59th birthday before the walk. But it’s a commitment. It’s a fantastic cause and it will raise interest because everyone will think it’s crazy. Towards the end of May, I started ‘training’. We visited friends in Ireland and walked up (and down) the ‘mountain’ behind their house. I struggled going up and down but we took it easy. The next day we visited Knocknarrea near Sligo. It’s 1000ft high and the path looked to be vertical and strewn with boulders. I made it up, with several stops and coming down had to zig zag about to make it less stressful. It was really difficult. I decided I needed to train properly or I wouldn’t make one day of the Embrace walk, let alone four. When we got back from Ireland, I started and continued through June, July and August (sometimes in 30 odd degrees of heat). Short 3 to 6 mile walks near home at first (which included a one mile incline to help with cardio) and then gradually longer ones. In all, I must have walked 250 – 300 miles in training. My last two weekends (including the bank holiday) I did walks of 10, 8.5, 22, 17 and 13 miles. By that time, I had graduated from trainers to walking boots. I had a great training top donated and a friend also gave me a 3 litre backpack to hydrate myself with. I had also learnt that I needed something to replace the lost salts, minerals and electrolytes rather that to just drink water (which just dilutes those lost things and can be dangerous) so I added tablets to the water. I also knew the calorie burn would be big on the walk so I bought energy bars and bags of nuts/sees/dried fruit to graze on. My aches and pains (especially in my hips) were helped by painkillers and gels. I also learnt about the miracle that are Compeed blister plasters. The actual walk was far harder than I imagined. Massively tough. Physically, I coped reasonably well up to around 10 miles, then the mental side had to take over. On days two and three, the last 3-4 miles were hell and I could happily and stopped in Sherringham and Sea Palling rather than completing the days. The biggest help was the other people walking with us. general banter made things go quickly and the tough times easier (not easy, just more bearable). I feel very proud of myself for having completed it. 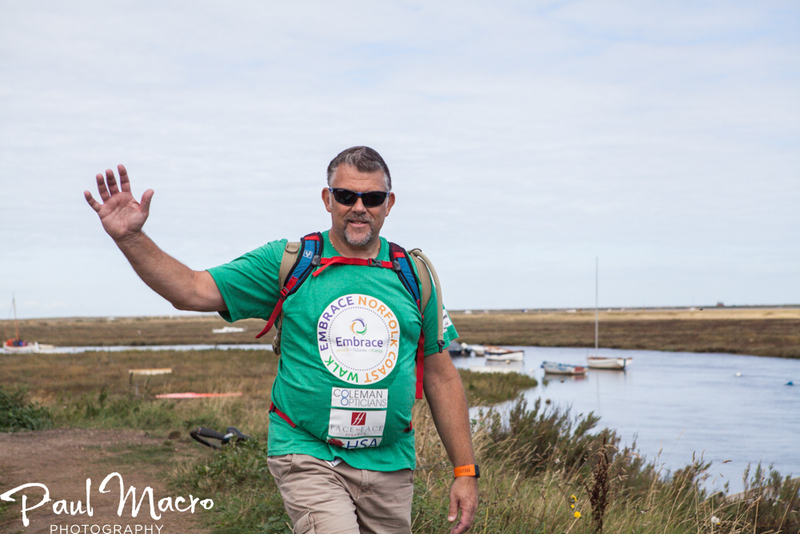 I am so pleased that we have already raised over £5,000.00 to help people. I lost over a stone in weight in training too, which means I feel great. If you would still like to donate visit our GoFundMe page. Would I do it again……………….. ?? No way. Not a chance.